In ancient China several thousand years ago, one of the oldest healing practices of Traditional Chinese Medicine was born. This remedy - acupuncture - was birthed from theories about the heart, circulation and pulse derived from the studies of the healer Shen Nung, known as the father of Chinese medicine. Many years in the future, in the mid-1980s, Yuan Zhi Fu, a young female doctor schooled in both eastern and western medicine, would bring this remedy, along with other TCM, to the villagers of San Clemente. And these ancient medical practices would first be established in the Family Acupuncture Center on El Camino Real at the top of Avenida Del Mar. 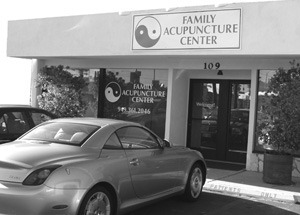 Today, the Family Acupuncture Center has relocated to East Escalones in North San Clemente, where it remains the first and longest operating TCM practice in town. And since its meager beginnings over 20-years-ago, Dr. Fu has treated more than 10,000 patients and expanded her staff to include her brother, Dr. Qin Fu, her sister-in-law, Herbalist Liu Er and Office Manager Sheila Ridge. Born and raised in a small village in southern China called Guangxi, the Fu siblings grew up learning the “magic” of TCM from their elders – grandmother, mother and uncles - who were all skilled in these practices. While growing up, the children thought that their elders were magicians, and it would be these influences that ultimately encouraged four of the Fu siblings to become schooled oriental practitioners, as well as trained medical doctors. In the bosom of this simple Chinese family, Dr. Fu was one of the first siblings to discover her destiny to serve others as a physician. As early as nine-years-old she watched her grandmother, mother and uncles combine the healing properties of herbs with the use of medicine balls, Qi Gong, acupuncture and Gua Sha to heal illnesses. And she herself experienced a cure from a heart murmur and loss of bladder control through her mother’s medicinal herbal healing powers, meditative breathing exercises and healthy diet of fresh vegetables. The experience of such pain in his own life would eventually influence Dr. Fu’s brother, Dr. Qin, to become an acupuncture practitioner. The pursuit of acupuncture schooling, first begun in China, eventually brought Dr. Qin to Santa Monica where he received a Masters in the field from the Samurai University. 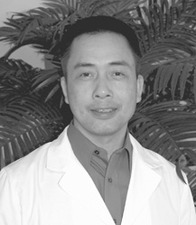 And now as an acupuncture specialist at the Family Acupuncture Center, as well as two clinics he has recently established in San Marcos, CA, he concentrates not only in pain’s relief, but in its root causes and cure. The root cause of illness according to TCM lays in the belief that imbalance in the body causes disease by blocking the flow of Qi, or the body’s vital energy source. It is believed that by keeping the opposing and inseparable forces of the yin (the cold slow passive principle) and yang (hot, excited, active principle) balanced, energy flows freely and the body remains healthy. When the energy flow is blocked along any one of the body’s 14-20 meridian points imbalance occurs, and it is believed that acupuncture can unplug these meridians releasing the flow of energy to restore the balance of yin/yang, and ultimately bring the body back to health. As sister/brother, female/male working together at the Family Acupuncture Center, Dr. Yuan Zhi Fu and Dr. Qin Fu’s aim is to bring the healing balance of yin/yang not only to their patients, but also to their practice. While Dr. Qin specializes in pain relief, Dr. Fu is presently focusing on cancer prevention, as well as all other internal illnesses. To this end, like western medicine she advocates annual check-ups, not only once yearly, but with each turn of the season. “It is very important to keep our vital organs healthy,” says Dr. Fu. “Seasonal check-ups address each organ, winter – kidney (affecting memory and body temperature), spring – liver (affecting digestion and temperament), summer – heart (affecting circulation), fall – lungs (affecting breathing). And it is through these check-ups that illnesses can be prevented and/or detected and addressed early,” she says. The coupling of eastern and western medical training has taught both Drs. Fu and Qin to detect and diagnose illness through their senses, by what they see, feel and hear. Examining the eyes for color and luster helps them to detect digestive failure and mental malfunctioning, and the study of the position of the eyelids helps them determine energy levels. By observing the tongue - the window to the internal organs and feeling the pulse, the condition of the heart, liver and kidneys can be discovered. And through the careful listening to patients’ complaints and conversations, state of mind and spirit can be ascertained. It is in this way that the methods for treatment can then be determined. As a western medical doctor as well as an eastern medical practitioner, Dr. Yuan Zhi Fu helps prepare advanced cancer patients for any surgeries or treatments they may need, by building up their Qi or energy. “The most advanced cases of illness are referred to western medicine,” Dr. Fu explains. “But I continue to be there for my patients through all their western medical procedures and after, helping them to build and retain the energy necessary to combat the effects of these treatments and recover from their diseases,” she states. In 2009, Dr. Fu’s plans include a focus on women and breast maintenance, something she is very excited about. As she talks about these plans, her face lights up. “Breast cancer is a leading cause of illness for women and I truly want to help women in 2009,” she exclaims, smiling broadly.